The First International Body Music Festival was a phenomenal sold-out success! Artists, volunteers, audience, donors, press, partners, production crew and staff - felt transported by the range of body music performance: that with basically the same instrument we express not just music and dance, but our cultures, our specific body language. As the first gathering of its kind, it proved a very powerful and moving experience. Word has spread, and we expect international attendance from Body Musicians around the world! Artists please do not use this contact. 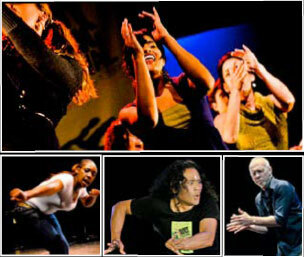 The International Body Music Festival is produced by Crosspulse, an Oakland-based non-profit arts organization dedicated to the performance, recording and education of cross-cultural rhythmic arts. Copyright © 2009 by Crosspulse, Inc.